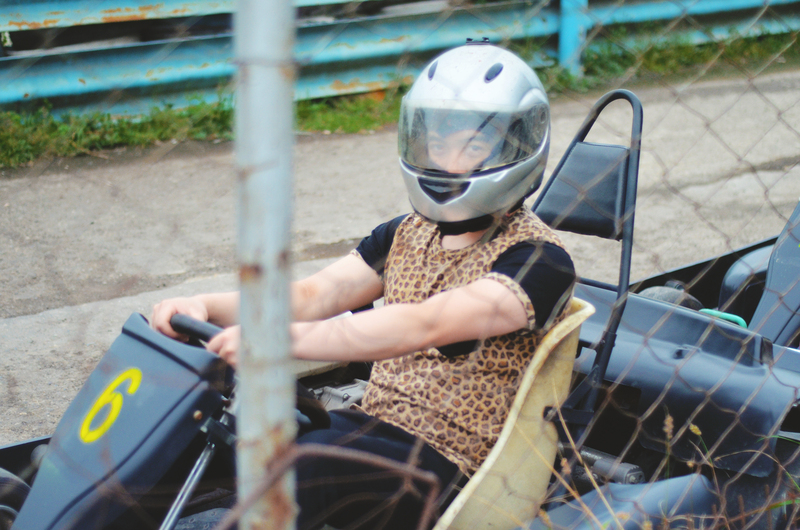 Back in April, Paul and I decided to go karting. If you haven’t heard of karting, it’s basically the stepping stone to your Grand Prix dreams. It’s simple although you need to have a basic sense in driving to enjoy it and to keep yourself and others from danger. Kartzone is one of, if not the only, kart racing center in Cebu. You can rent karts for Php 400.00 for 8 laps which can either be a single-seater or a double-seater. We wanted to bring our GoPro with us and take the double seater one but we weren’t allowed so I let Paul take his adrenaline fix while I watch him zoom everywhere. Before your actual use of the karts, you must undergo a brief seminar which discusses several key points in the race track such as flag meanings, usage of the kart, and do’s and don’ts. After the seminar you’ll be seated and wait for your turn. The center only allows limited number of racers inside the track as to not crowd it too much or else you won’t be able to accelerate (which basically is the whole point), so the racers come in batches. When it’s your batch’s turn, you’ll be given a mask and a helmet then you select a kart. An assistant will start your kart and off you go for 8 laps. It was rather quick that day since there weren’t many racers so we finished early and proceeded to a fairly new recreation area near Kartzone which is the Rainforest Park Cebu, approximately a 5 minute walk. The park is a mix of leisure and adventure, with a rope obstacle area, viewing area for animals, a fish spa and a restaurant. You can see their rates here. We opted to go for the All-in Attraction ticket covering the Jungle Adventure, Oceanarium and Amazon Aviary for Php 300.00 per person. The Jungle Adventure is a series of rope obstacles in an enclosed area with several crew to guide you. One thing that really stood out for us both that day was how careful the crew was guiding us. You will never be not attached to your harness and a guide will be with you throughout the obstacles. Once you get strapped in, you start and climb this simple-looking rope net up to the platform about 20 feet from the ground. Hmm, not so simple actually. Once you’ve reached the top, you’ll zipline your way across the area, a short 5 second experience. Next, you’ll cross the Burn Bridge. Easy peazy. Then slide your way to the next destination. This was the hardest for me. It had the least ropes (among all the rope obstacles, so excluding the catwalk bridge) to grab on to and you really need to balance so you wouldn’t swing too much. I started taking actual steps which made the rope swing scarily so the guide advised to just slide while I grab the upper ropes, one after the other. Next is the catwalk bridge without anything to grab on to, just your harness and your balancing skills. It’s a very thin metal connecting the “slide” bridge and your endpoint. As long as you don’t look down, you’ll get through it easily. Also, don’t bounce! You again walk through the catwalk bridge and the slide bridge to get to the center of the obstacle. I know! That one hard thing and you do it twice, haha. These swings aren’t connected to each other, so if you’re not careful and put so much weight on each, you’ll end up swinging far from your next swing. My tip would be to make it fast so you won’t have to cause so much motion in each step. You then go through the last rope obstacle, quite similar to the one above but without the wooden steps. This is much harder but quick since it was a shorter trip, about ten steps. You then climb down through a normal metal ladder to the ground. But that doesn’t mean you’re done, you get to experience basic rock climbing too! You get to have one go and you’re done! We were the only ones that went through the obstacles at that time, good thing we’re two brave souls so we did all those quickly too. The guide was so careful and the other crew who took our pictures also did everything he can despite the lens I brought that day. 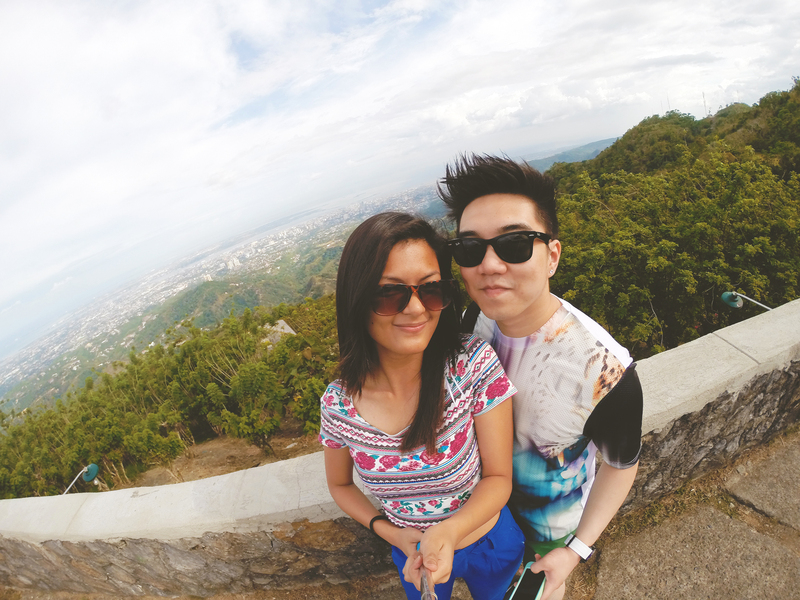 I really wanted to use GoPro but we weren’t allowed. 🙁 The guide took so many blurred photos too with my 50mm and I can’t blame him. Haha I’m just glad he took so many that there were a handful of lucky ones. This was also an additional service for them, you get to pay a hundred for unlimited pictures but using your own camera. I think that’s enough since he has to go through the obstacles too just to get a good angle of you. After the Jungle Adventure, we went to the Amazon Aviary and was greeted by a deer just casually walking around the area. 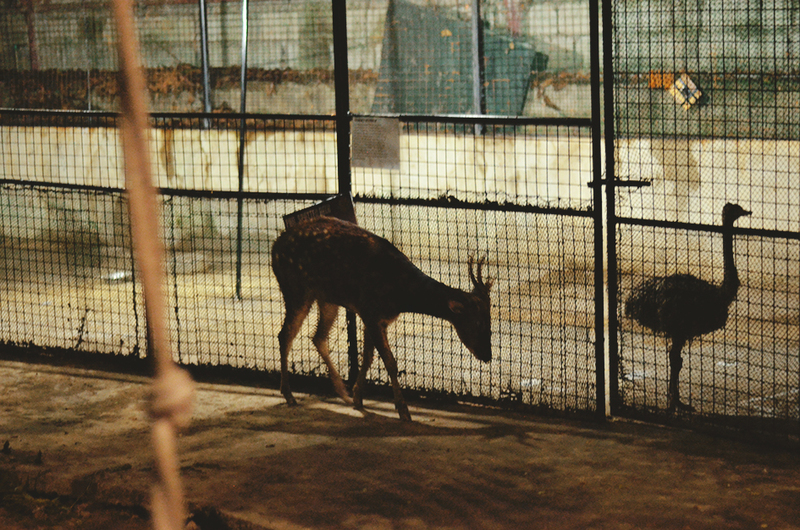 There were also numerous caged animals, mostly of bird species. The white parrot pictured below was the center of the aviary and says hello to the guests! You can also offer your arm as its perch and talk to it… if you know bird talk. Have you seen Rio? He looks a lot like Nigel, doesn’t he? The bird, not Paul. Outside the aviary, you have several animals to view including this Philippine crocodile. It was already dark so going through the forest is actually scary. There are leaves everywhere and you get paranoid that birds or snakes will suddenly appear. So maybe, go to the park while it’s still bright and sunny. Speaking of snakes, we went to the Oceanarium next and found two. A crew dared us to touch it and.. can you hear my muted screams below? Carrying the snakes was a fun experience. It may look so flexible but while it was crawling around my neck, I could feel its tiny bones gliding. Ahhhh thinking about it makes me cringe. There were also lots of fishes inside the Oceanarium, I hope they maintained it better though. The aquariums were too foggy that it looks unclean. There was Nemo and Dory and other typical fishes. I’ve been to lots of big aquariums already that it wasn’t too impressive anymore. But then again, the snakes made the Oceanarium scary fun so there’s that to compensate the fish display. As you can see from the photos above, there are lots of tables and chairs inside the Oceanarium as it is also a restaurant. We didn’t eat so I won’t be able to give you a review regarding their food. Let me know in the comments if you have and what you think of it! Before ending our day, we went to experience 30 minutes of fish spa for Php 100.00 per person. Those are Paul’s chubby toes and several fishes eating away his dead skin. Eugh. I only managed to put my feet in the water for 5 minutes though. I couldn’t stand the vibration caused by the fishes eating you. It’s not for the ticklish. And since we were the only ones in the spa, I think we stayed for more than 30 minutes inside. I don’t know if the staff will get trouble for this but then we’re also feeding the fishies, so win win? Haha I must say, the friendly and helpful crew made the experience so much better. It’s affordable and you get to do so much in the park, a perfect day out with the family and friends. A must visit!